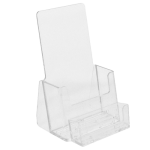 This is the ultimate counter display for two tri-fold brochures, complete with the added elegance of two business card / gift card / coupon holders. 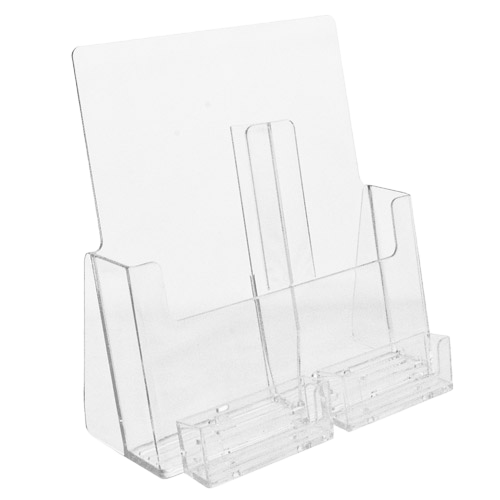 This brochure holder combination gives the option of having two different tri-fold brochures side by side with card holders attached. 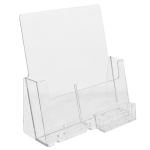 The result is a clean, crystal clear, affordable display for any counter application. This is an affordable, functional combination display. Show two brochures, up to 4 1/2'' wide, side by side. Two individual card pockets attach for business cards, gift cards or coupons. Restaurant take-out menus, coffee shops, gas stations, concierge desk tops, tourism outlets and other high traffic counter locations.